About a year and a half after my chemo ended, I got an EOB (Explanation of Benefits) for a “medical procedure” (one of my favorite euphemisms of all time) from our insurance company. This form explained how much they would and would not pay, how much the hospital would write off, and how much we owed. Since I couldn’t remember any recent appointments, I thought the hospital had mistakenly billed our insurance for someone else. My daughter reminded me that I’d gone in for a port flush — a process so minor that I’d forgotten about it. A nurse stuck me in the arm — thereby accessing my port — ran saline through the device to keep it clean, and gave me a shot of Heparin to help prevent clots. Total time elapsed: About five minutes. How could this be? When I visited my doctor and have a port flush and have blood drawn, the bill is less than $600, more like $200. The insurance lady couldn’t answer that question. I heard back a few days later. No surprise, they said the bill is correct. These costs, it seems, are set by Medicare and not the hospital. Keeping a port means having it flushed every two months. How could I reconcile having our insurance waste $1,858.56 a year on this? And the $464.64 that I would be paying could certainly be better spent (perhaps on my daughter’s college texts?). I had to have to have the device taken out, which really ticked me off. Explanation of how a port works can be found at:http://tinyurl.com/y8snrty Image above from same site. I apologize for whining, but back then I had blood drawn every time I see my doctor. This meant I could look forward to a lot of poking and prodding around in my arms as the nurses try to find a vein. Still, chemo nurses are the best in the business when it comes to finding a vein. And it turned out I was making a tempest in a teapot. Because I have no more port in a storm. Addendum: Looking back, I know I wanted to keep my port for if/when my cancer came back. It’s the same reason I still have my wig. Pessimistic? I don’t think so. It’s more like carrying an umbrella because you know then it won’t rain. Also, in the interest of fairness, I should mention I asked a nurse about this. She said since ports access veins directly, what I called “poking” truly is a procedure, which can go very wrong if done incorrectly. I never did find out why it was cheaper to visit my oncologist, have blood drawn and my port flushed. Cancer Lesson #50: Everyone needs a hand to hold on to. John Cougar Mellancamp sang about it in the eighties, and it’s true. Cancer treatment is challenging, with the difficulties being different for each person. 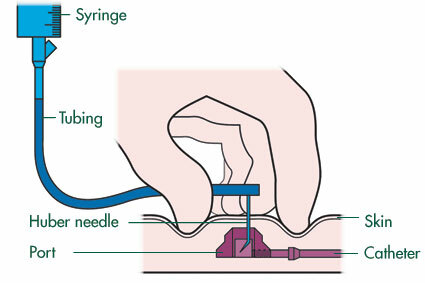 I found the constant needle jabs particularly distressing, so my “hand” was literal. Whenever I had to get a shot or have my port poked – and I’m sure the medical profession has a more technical term for that procedure – The Engineer or Darling Daughter came along to hold my hand. Before chemo, I would have sucked it up. Now, three years later, I do the same. But when I was in treatment, I realized there was no harm in asking for a little comfort. If that made me a wimp, I didn’t care. There are plenty of things about cancer that can’t be made any easier so if this one small thing helped, I determined to grab on to it with, well, both hands. The point is, cancer treatment is hard enough without thinking you need to be brave every single minute. So quit trying to be a hero already. It’s okay to accept help now and then. It’s a “whatever gets you through the night” kind of thing, with no right or wrong way to do it. So How is the Chemo Going, Anyway?